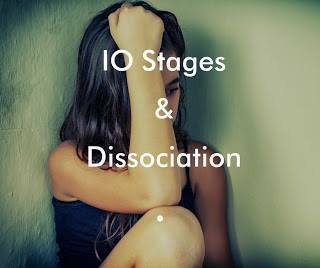 Home » Living with or being involved with dissociation can be mentally and emotionally exhausting. » Living with or being involved with dissociation can be mentally and emotionally exhausting. Title: Living with or being involved with dissociation can be mentally and emotionally exhausting. It can feel like you have to perform "mental gymnastics" from dealing with the lying (even when confronted with undeniable proof ), the gas-lighting, the triangulation, the projection, the constant contradictions, the manipulation, blame-shifting, the charm they lay on, the inflated sense of self - even subtle forms of torture, such as sleep deprivation, these people inflict on their victims - appears to be conscious and calculated to push the target of their "affections" past their limits, into surrender - and ultimately into total compliance - as a source of dissociational Supply. Children, spouses, friends, lovers - those closest to dissociation - are not considered individuals in their own right by the dissociated - but rather extensions or, in the worst cases, the property of the person practicing dissociation. Even after finding out that you are dealing with a sub-conscious disorder, if you don't protect or remove yourself from the situation1, you may find yourself entering into a state of mind where you instinctively try to fix or fight the dissociatist's illogical attitudes and behaviours. You may find yourself becoming hyper-vigilant, trying to second guess them, trip them up, lay down ultimatums, call them on their lies, or constantly trying to stay one-step ahead of their ever-changing rule-book. You may even find yourself trying to mirror their behaviours to some extent in order to manipulate them, as they have manipulated you. This can be both futile and attractive to the dissociatist, as they often relish the challenge. If you ever do manage to get "one-up" on a dissociatist, it is likely to be a hollow "victory" at best. They may rage, play the victim, or disappear. None of these outcomes gives the victim any true satisfaction. More than any other disorder dissociatists are like sub-conscious vampires, attaching themselves to you in a way that drains you of your resources (emotional, mental and financial) and leaves you questioning your own worth and sanity. Often, dissociates are able to imitate or approximate caring about others when it is convenient for them to do so. However, they typically do not perceive that anything outside of their own sphere of wants and needs matters. It simply doesn't occur to them to consider the needs of anyone else, or the long-term consequences of their own behaviours. Those that have become dissociated can be highly intelligent, witty, talented, likably, and fun to be around. They can also elicit sympathy. The Dissociated can become very opportunistic. They can make a show of being "generous" but their generosity usually has strings attached. Labels: Living with or being involved with dissociation can be mentally and emotionally exhausting.